Does Your Home Have Old or Dirty Insulation? If your attic has old or dirty insulation, it may be time to get it looked at and replaced. Old attic insulation is often inefficient and could lead to unnecessarily high energy bills. 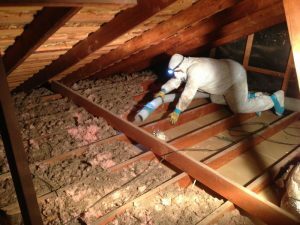 Dirty attic insulation, on the other hand, could have been the result of pests like rodents and birds that contaminated the insulation, which can lead to an unhealthy home. If either of these situations are the case, it’s time to remove insulation from attic spaces to maximize the safety and energy-efficiency of your house. Clear Choice Energy Solutions offers a professional service that will remove the old insulation materials from your attic in a controlled way, without any disturbance to the rest of your home. Our attic insulation removal service involves the use of a custom-designed, high-powered vacuum, which is connected to a very long hose. All of the dust and debris can be suctioned up safely and efficiently and collected in a large-volume filter bag, which is specifically designed to collect the insulation material. This material is then placed outside of the home. With such technology, removing blown-in insulation is a much cleaner and safer task.